January | 2014 | GameXcess.net - Gaming News, Videos and Editorials! I could not be happier with Nintendo right now. Just as soon as I completed all the actions in the Bravely Default demo, I checked the Nintendo eShop and found Nintendo had once again taken my advice. The Legend of Zelda: Four Swords Anniversary Edition is back on the 3DS’s eShop and you can download it for free right now up until February 2nd, 2014. The Legend of Zelda: Four Swords Anniversary Edition is a special promotional port of The Legend of Zelda: Four Swords, originally released bundled with the game The Legend of Zelda: A Link to the Past for the Game Boy Advance. It is redesigned to take full advantage of the features of the 3DS, including wireless multiplayer. The game was originally created as a special promotion for The Legend of Zelda’s Anniversary, and was released for free only for a short time. As this period of release took place before the release of the 3DS XL, I was not lucky enough to be able to download this game, and seeing the game’s listing in the official Hyrule Historia only served to put salt on that wound. Now that it’s back out, I couldn’t hit the download button faster. As far as I know, Nintendo has not widely reported on this. Their website makes a small mention of the event, but I cannot recall a single message on their Twitter Feed or YouTube Channel. Regardless, if you have a 3DS or plan to pick one up before the 2nd of February, you have no reason not to give this game a download. Nintendo said it may be a very long time before they bring it back. The Legend of Zelda: Four Swords Anniversary Edition is free right now exclusively to the Nintendo 3DS. Yesterday, Nintendo released the latest gameplay trailer for Square Enix’s newest RPG franchise, Bravely Default. Inspired heavily by the gameplay of earlier Final Fantasy games, Bravely Default takes full advantage of the 3DS’s features (including StreetPass), while still offering a ton of options you will recognize from earlier Final Fantasy games, like a great jobs system. I’ve put several hours into the Bravely Default demo, and I hope to be lucky enough to complete it and unlock all of the demo’s extra bonuses before the full version of the game gets released, because the demo’s unlocked bonuses carry over into the main game. So check out this latest gameplay trailer. If anything, it should be something fun to watch while you wait for Norende to finish rebuilding. Bravely Default is coming February 7th, 2014 exclusive to the Nintendo 3DS. You can download the demo right now off the Nintendo eShop. The third entry in the Final Fantasy XIII series, Lightning Returns: Final Fantasy XIII, is coming in just a few weeks. To help prepare anyone interested in picking it up who may not have played any of the previous Final Fantasy XIII games, Square Enix has produced a FANTASTIC retrospective on the series story, with a little twist. Instead of cutting together gameplay footage from the game’s CGI cutscenes, this new video is done very much in the style of the classic 16-bit RPGs like Final Fantasy VI (Final Fantasy III is the US SNES version’s name) and Chrono Trigger. This could have been done because that era is considered by many to be the finest era in the history of Console RPGs. Well, check out the video below to see for yourself. It really puts the RETRO in retrospective. Lightning Returns: Final Fantasy XIII is coming February 11th, 2014 to the Xbox 360 and Playstation 3. A Collector’s Edition for the game is for sale exclusively through the Square Enix Online Store. Anyone who preorders any version of the game from a participating retailer will get an exclusive Lightning costume based on Cloud’s outfit and Buster Sword from Final Fantasy VII. Saturday night I received incredibly shocking and distressing news that Justin Carmical, better known to the rest of the internet as JewWario, had died. 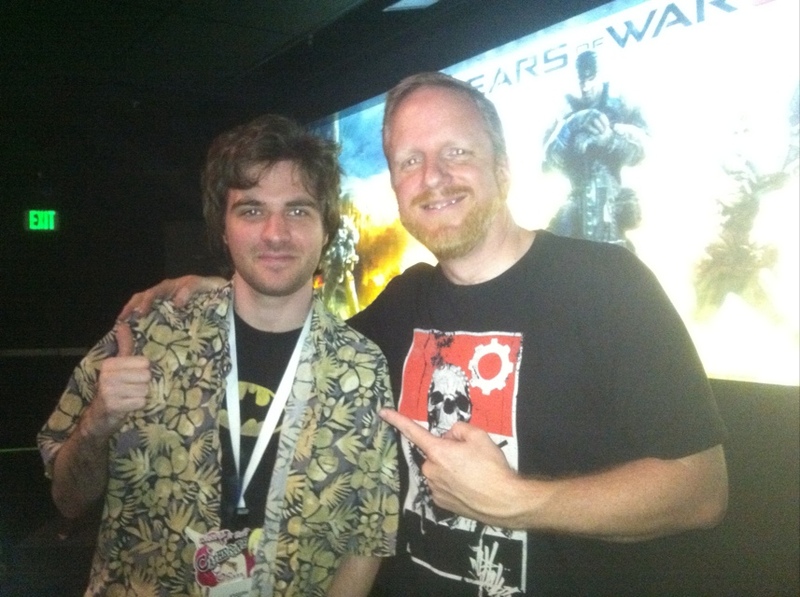 A former member of That Guy With the Glasses, Justin had one hell of a career as a video game journalist. He was the host of You Can Play This, an import game review series, participated in three anniversary features for TGWTG (Kickassia, Suburban Knights, and To Boldly Flee), and he was also contributing to William “Suede” Dufrense’s review series on the Pokémon feature films. I know this is not late breaking news, as many other organizations and people have reported on this since the internet heard the news some time around Saturday. Having never met the man myself, I can only speculate on how to feel, but after pondering it for several days now I don’t know if I’m any closer to being able to express my feelings about this. Needless to say, I truly respected the man’s work. I thought he provided a unique perspective on his videos, and had a style all his own. I can think of no better way to honor the man I respect than to show some of my favorite work of his. The following was a short film he did on the third anniversary of his channel. In it, he discovers a new power he can use to fight a new evil. You can watch it part 1 here and part 2 here. Justin was planning to create an entire webseries for his FamiKamen Rider character. Now, we will never be able to see it. Just as promised, Maniac plays through the entire Lightning Returns: Final Fantasy XIII Demo on the Xbox 360. The video is directly captured through a digital HDMI source in native 1080p and presented without commentary. From someone who has played Final Fantasy XIII, I can say that I was not as interested in playing this game until I got a chance to check out the demo for myself. I’m really happy that I did as I LOVE the new real-time combat system. Check it out. For reasons of time, I chose not to include the most recent Lightning Returns: Final Fantasy XIII trailer that played as soon as the demo wrapped up. If you would like to watch it, you can check it out below. Lightning Returns: Final Fantasy XIII is coming February 2014 to the Xbox 360 and Playstation 3. Hot off the presses, Microsoft has announced the purchase of the Gears of War franchise from Epic Games. Next to Halo, Gears of War is one of the biggest exclusive franchises that the Xbox 360 held over Sony platforms since the Playstation 3 launch. However, up to today, the Gears of War property was owned by developer Epic Games, and if they chose, they could have released it on other platforms like the PS3. With Microsoft buying the property, there is no chance of a Gears of War game coming to a non-Microsoft platform any more. This is highly unusual for Microsoft, as they typically acquire IPs by purchasing the companies that developed them outright. My guess is that Epic either wished to stay independent, or Microsoft had no interest in acquiring extra companies right now. The details of the deal are still pretty secret, so we don’t know how much Microsoft paid for the franchise yet, but Microsoft did acquire Epic team member Rod Fergusson (seen here) as part of the deal. Microsoft says they plan to announce their future plans with the IP later this year. My bet is they may announce something at this year’s E3. The latest release in the inFAMOUS series, inFAMOUS: Second Son, is going to take place in the city of Seattle. If you’re going to reproduce Seattle for a gaming environment, you’re going to want to go all out, and that means also recreating Seattle’s signature weather patterns. Thanks to the power of the Playstation 4, the game’s developers plan to do exactly that, and here’s how they are doing it. inFAMOUS: Second Son is coming March 2014 exclusive to the Playstation 4. Square Enix is in the process of remastering Final Fantasy X and Final Fantasy X-2 to the PS3 in glorious HD with entirely new scenarios never released in North America. However, that is not all Square Enix is planning to do with this HD remaster, they are planning to release two Special Collector’s Edition versions of the game for fans. The first is very similar to the Kingdom Hearts 1.5 HD ReMIX release in that it will include a detailed artbook. This version will be available at no extra charge for anyone who preorders the game from participating retailers. The other is a very special Collector’s Edition which will include a full sized artbook, and the soundtrack for both games on Blu-Ray Disc. This CE is going to be so rare it will only be available on Square Enix’s Online Store. Take a look for yourselves to see which version you want to pick up. Final Fantasy X/X-2 HD Remaster is coming March 2014 to the Playstation 3. A Playstation Vita version is also in development. Maniac unboxes a Nintendo 3DS game card travel case he got from Club Nintendo. Is it worth the 400 points? Let’s find out.